Quilt meets sleeping bag! 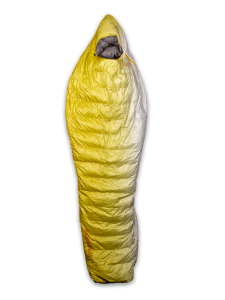 Big Agnes is a household name when it comes to the sleeping bag market and the Summit Park 15 is a quality bag that cuts back on weight with the assumption that when you are laying on down it doesn’t function as insulation. That means your insulation comes from the pad that is partnered with the bag, and in my case the Big Agnes Q-Core Deluxe three season option works well. The bag has a built in sleeve that holds the pad in place with the idea that you can’t slide off of a pad that is directly attached to the bag. The down filling is 600 weight Downtek which in layman’s terms means that it has been treated with a water repellent that prevents the clumping when wet that untreated down is known for. Because it won’t clump up, warmth is retained and it’s possible to get a good night’s sleep in damp conditions. The outer shell is built from a tough rip stop Nylon that is also treated with water repellent which makes this bag an ideal choice for late September and early October when the wet conditions really begin to take hold. 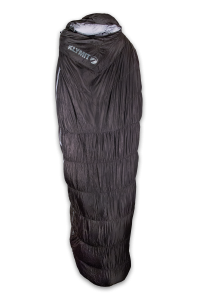 The Summit Park is accurately rated down to 15 degrees, in hunting terms that means you can expect to be comfortable through most of October in this bag. If you get cold easy, supplement the bag with base layers in the late season and you are set. The bag itself is wide in the shoulders and knees with a hood that wraps around your head comfortably keeping the drafts out all night long. The long version, comfortable up to 6’6”, we tested comes in at 4lbs, 3.6 oz before the pad and the weight will go down if you don’t need the long version. The bag packs down to 9” by 20” in the long version and you can find it at www.bigagnes.com for $329.95 or take a look at your local Sportsman’s Warehouse for a variety of models from Big Agnes. The KSB 20 is rated at 650 Fill-power which will keep you nice and comfortable down to 23 degrees, hence the name of KSB 20. This bag is 82” long and 30” wide, weighs 2.7 pounds and stuffs down to the size of a small watermelon which puts it in the running as a nice option for early season hunts. The bottom half of the bag is a hugger style which traps and keeps warm air as close as possible to your legs, which means you’ll warm up quicker and stay warm easier. The draft collar and body baffles are little extras that can make a difference when it comes to thermal efficiency. Some other features like the stash pockets give you a place to keep your head lamp or contact case so you can easily find them in the dark. It also comes with a storage sack, which it should be in at all times besides when being packed in, to maximize the loft and extend the life of the down. Perhaps the most important trait is the DWR coating. This is the type of coating many hunting manufactures treat their products with. It will repel water keeping moisture away from the down, keeping it dry from condensation dripping or even worse, a leaking tent. 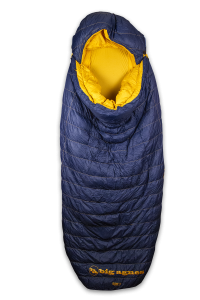 2 lbs 6.1 oz is light, especially in the form of an 800 fill sleeping bag that stays warm down to 20 degrees. The Thermarest Parsec 20’s list of attributes make it a quality bag for the lightweight backpack hunter. Starting from the inside out is the Nikwax Hydrophobic Down that is engineered to shed water and keep you comfortable in damp conditions. The outer layer is a 20D Polyester treated with a DWR to keep the moisture out before it even hits the Hydrophobic Down. This bag will keep you dry no matter what! A feature that is almost a deal breaker at this point in my hunting career is functional draft collars around the neck and effective zipper collars. I can’t afford to be waking up every half hour with a cold breeze running down my neck, or worse when my knee or hand touches a cold zipper. The Parsec has effective collars running down both locations that retain warmth and aren’t absurdly large and uncomfortable. One of my first tests of a zipper collar is making sure that it doesn’t snag while closing, the Parsec’s material stays out of the way while being zipped but isn’t stingy on the down that kills the drafts that can come from the zipper. Keeping the zipper in place at the top is a snap rather than the typical velcro that can easily snag hair or become separated. The down is distributed in a 60/40 split with the larger portion structured around the core of the body where the most warmth is produced. Therma Capture technology lining is placed on the top of the bag to retain warmth and maintain a restful night when the backcountry is getting chilly. The bag runs anywhere from $379.95-$419.95 and ThermaRest products can be found at Sportsman’s Warehouse or at www.thermarest.com. 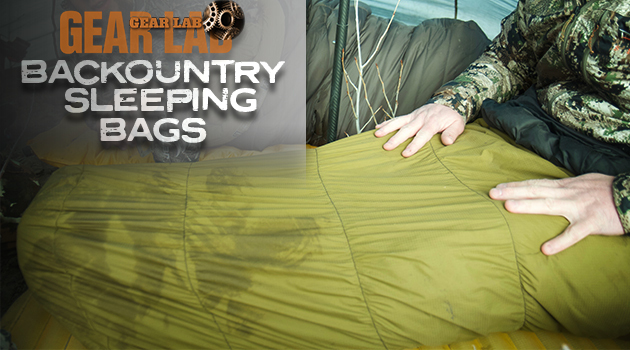 The post Eastmans’ Gear Lab: Backcountry Sleeping Bags appeared first on Eastmans’ Official Blog | Mule Deer, Antelope, Elk Hunting and Bowhunting Magazine | Eastmans’ Hunting Journals. Previous articleIdaho Hunting Unit Shutdown?